Sometimes, you don’t need to pack the car or splash out on an expensive flight for a little much needed R&R. More often than not, there’s a very attractive alternative right under your nose. 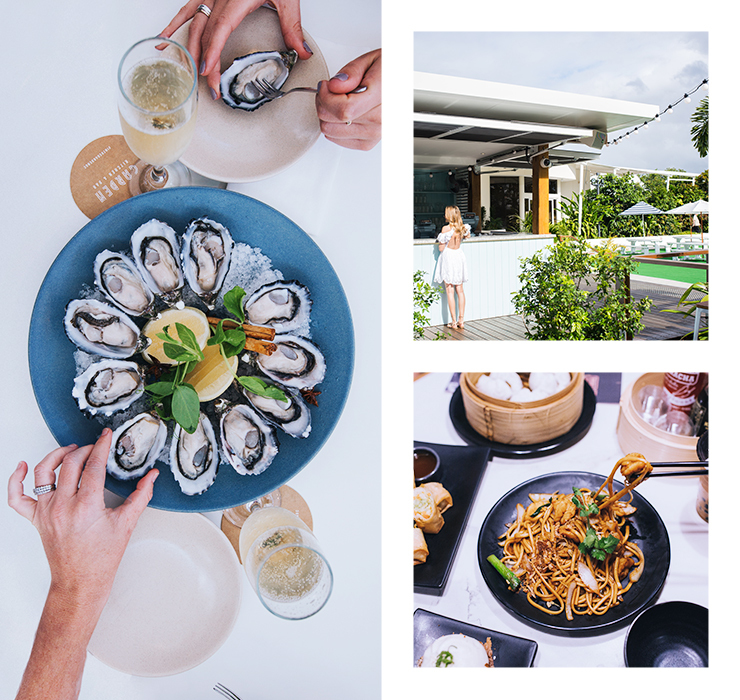 Our old faithful Jupiters has morphed into a stellar entertainment and culinary destination we can all be proud of. Over the past couple of years we’ve seen the property raise the bar, evolving into the place to see and be seen on weekends. It’s all been leading to this moment, and thankfully this is just the beginning for the recently renamed The Star Gold Coast, folks! The foodie, entertainment, and accommodation offerings are soon to double before our eyes, and we can’t even fathom how epic the end result will actually be. So, we packed our overnight bag and heels, and got familiar with a new look The Star. 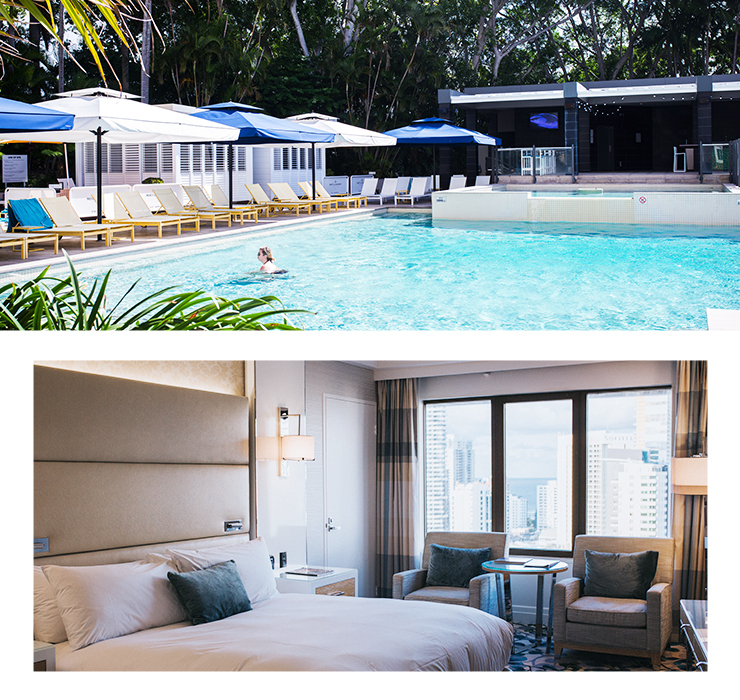 Here’s how to have a totally luxe 24 hours, Gold Coast style. Wanna come along? We’re giving away a sweet weekend holiday at The Star, loaded with eating, drinking and other goodies. Click the banner below to enter. Good luck! After a staggering top to bottom renovation, The Star is virtually a new hotel! The envy of hotels across the Coast, the spacious suites are plush AF and the décor is bursting with playful sophistication (you’re staying in a casino, after all). Following a Friday evening check in, we bet you’ll wake up feeling refreshed and ready to squeeze as much as you can out of your mini vacay. Wander down to M&G Cafe and Bar for espressos and a moreish pastry, or order breakfast in bed—because, holidays. Lazy mornings by the pool? You don’t need to ask us twice. Take your staycay to the luxe level and reserve a private cabana for the morning. Work on your tan, swim a few laps, beckon the pool boy for a refreshing smoothie (or cheeky cocktail, ‘cause it’s five o’clock somewhere, right?) and then repeat. Holidays are about overindulging, which means eating all of the food. The Star’s most recent foodie addition, Mei Wei Dumplings is casual and funky. So no one will bat an eye when you order one of everything on the menu and share it with your vacay buddy, yum cha style. Be warned though, the mind boggling menu is 50+ items long and peppered with spring rolls, noodle soups, wok stirfry and all the hand crafted dumplings your little beating heart can handle. Summer may be all but a distant memory for southerners, but thanks to balmy autumn afternoons and the sun drenched setting of Garden Kitchen & Bar’s alfresco patio and lawn, those infectious always summer vibes live on at The Star. Gold Coast locals love this place and it’s not hard to see why. As magic hour casts a golden hue (perfect lighting for selfies, wink wink) pull up a patio stool with a Frosé in hand and feast on a plate of oysters el natural. Or, snag a beanbag on the grass and pinch yourself as you smile and think how lucky we are to live where we do. There’s sushi and sashimi, and then there’s Kiyomi. Sure to impress even the most discerning of aficionados, one hatted Kiyomi is headed up by none other than Chase Kojima, who also commandeers the Sokyo kitchen at The Star in Sydney. Come hungry and splash out on Kyomi’s signature seven-course degustation. Think: Hiramasa kingfish with miso ceviche, ocean trout with pickled wasabi, cuttlefish with tarragon ponzu, and more, all meticulously paired with gorgeous Australian and Japanese vinos. Trust us, you’ll die and go to foodie heaven. We don’t know about you, but we’re pooped. And stuffed, from all the epic wining and dining. If you’ve still got the energy, have a flutter at The Star’s casino or a nightcap back in the Garden Bar. Or, better yet, slink away guilt free to your plush king size bed, because we’re hedging our bets you’ll wanna do it all over again tomorrow. Editor’s Note: This article is proudly sponsored by The Star Gold Coast and endorsed by The Urban List. Thank you for supporting the sponsors who make The Urban List possible. Click here for more information on our editorial policy.